When a small-cap semiconductor company starts getting mentioned alongside the likes of Microsoft (MSFT), Apple (AAPL), Facebook (FB) and Amazon.com (AMZN), Wall Street tends to take notice. That’s what happened recently when Inphi (IPHI), a maker of high-speed semiconductors, said it will team with Microsoft on a new product designed to make it easier for companies to connect data centers. The news prompted several analysts to upgrade shares of Inphi, which has a market cap of about $1.3 billion. 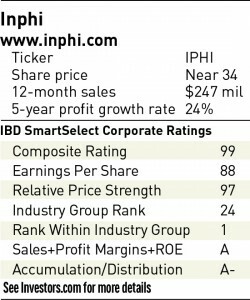 Deutsche Bank’s Ross Seymore upgraded Inphi to buy from hold and hiked his price target on the stock to 40 from 30. Analysts with Northland and Stifel Nicolaus also raised their price targets on Inphi. Inphi’s new product — known in industry parlance as a 100-gigabit, 4-level pulse amplitude modulation (PAM4) platform — has been dubbed “ColorZ.” It’s capable of connecting multiple data centers within 50 miles. Introduced on March 22 at the annual Optical Fiber Communications conference in Anaheim, Calif., ColorZ helped Inphi shares to a 5% gain that day and almost 8% the next. The stock kept moving higher in subsequent sessions — setting a new high of 34.87 on April 1 — and it currently trades near 34. Inphi is due to report first-quarter results after the close on April 28. Analysts polled by Thomson Reuters expect earnings of 26 cents a share, up 13% from a year earlier. Revenue is seen rising 12% to $66.3 million. Full-year earnings are expected to climb 24% in 2016 and another 30% in 2017. The current industry standard is for a much slower 10-gigabit platform. ColorZ also is less expensive than other 100-gigabit options, such as long-haul products that cover much wider distances. The product will be able to deliver more than four terabits of bandwidth over a single fiber when it becomes available later this year, likely during the third quarter. ColorZ represents another stage in a relationship that began in 2013, when Microsoft enlisted Inphi to help resolve some of its data center issues. “The ability to provide high bandwidth connectivity in a form factor that is smaller, uses less power and is less expensive than today’s solutions is a benefit to Microsoft and the cloud market in general,” Jeff Cox, Microsoft’s senior director of network architecture, said in a statement. Some analysts expect ColorZ to rival infrastructures by such tech heavyweights as Apple, Facebook and Amazon.com — all of which have been expanding their cloud operations to meet growing demand for online content. In addition to speeding the process of building out data centers at Microsoft, the ColorZ also is expected to expand the entire cloud computing industry. 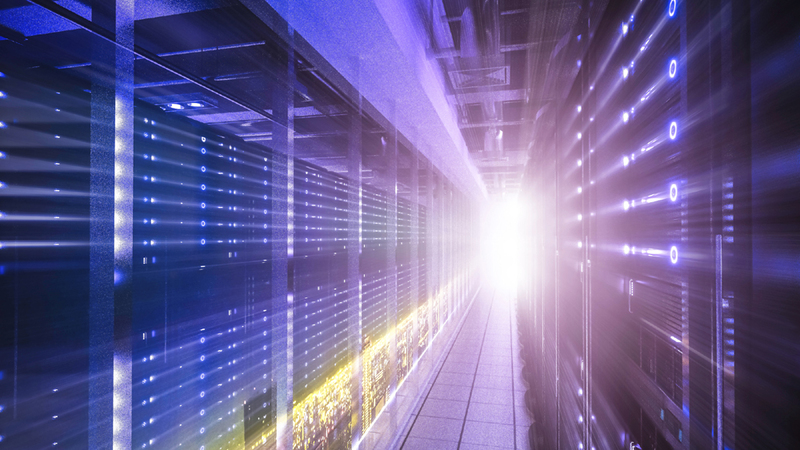 The data center interconnect market is estimated at just above $1 billion, according to industry tracker ACG Research. It is expected to reach $4.7 billion by 2019. Inphi has a number of products designed to tap into that and other markets. The company’s lineup includes analog multiplexers, encoders, amplifiers and memory buffers for servers, routers and storage equipment. These products let central processing units use available memory resources more efficiently. It also provides high-speed analog semiconductor solutions for the communications market and high-speed memory interface solutions for the computing market. Much of Inphi’s growth is expected to come from rising demand for 100-gigabit optical networks amid what some industry experts call a “data explosion.” This explosion has been driven by the growth of social networking, cloud computing, e-commerce and “Big Data” — the term used to describe large, complex data that cannot be handled by traditional data processing applications. Last month’s Inphi-Microsoft product announcement fortifies Inphi’s leadership in the transition, analysts say. In a recent note, Sterne Agee CRT analyst Douglas Freedman said the announcement demonstrates Inphi’s ability to build optical solutions that are “market disruptive” and can expand the total available market. Inphi uses the occasional acquisition to bolster its technology and market share, though the company also invests a lot of money in research and development. Last year its R&D expense was $106.4 million, up 50% from the prior year. Financially, Inphi has delivered nine straight quarters of double-digit revenue growth. As for the bottom line, it had posted eight straight quarters of double- or triple-digit earnings growth before the streak ended during the 2015 fourth quarter. Earnings for that quarter came in at 32 cents a share, up 7% from the prior year and 6 cents above consensus analyst views. Revenue gained 18% to $64.4 million, in line with estimates. 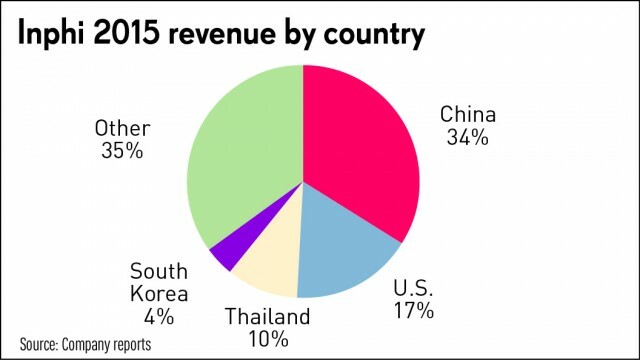 One potential headwind is Inphi’s exposure to China, where the company received just more than one-third of its revenue last year. China’s slowing economic growth is seen as a risk for companies with large stakes in the country, though CEO Tamer downplayed that risk during the fourth-quarter conference call.